The reliability of the catenary determines to a large extent the operational efficiency of electrified railways on the whole. Development is carried on in a number of countries to improve both the design of the catenary and the techniques used to maintain it. 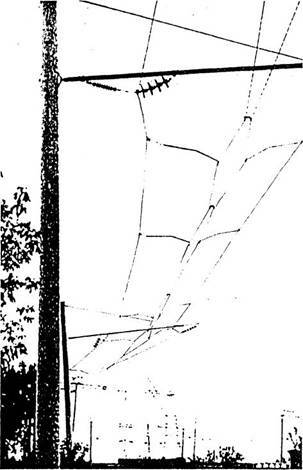 In the USSR a basically new type of catenary has been developed - an Automatically Compensated Spatial-Rhombic Catenary (ACSC). Recently a theory for making mechanical calculations, determining the geometrical dimensions and the rigidity of the ACSC at any point of a given section has been developed at the All-Union Railway Engineer Training Institute (by correspondence). Apart from the results of theoretical investigations experience has been gained from tests and regular operations. Presently the spatial - rhombic catenary is in operation on a number of open sections of mainlines as well as in tunnels, galleries, on bridges and other fixed line structures. Based on the development results and on the experience accumulated while carrying out theoretical investigations, tests, designing and operating this type of catenary over a decade now it has become possible to identify more specifically the scope of utilization of the ACSC taking into account the various operational conditions. The specific feature of the ACSC as compared with the conventional vertically suspended type of catenary is that it consists of two contact wires and two messenger wires. The contact wires are layed out in a form of rhombs in relation to the axis of the track. In order to attain this the contact wires are connected through articulated strips while in the middle of a section between two such strips each of the contact wires are fixed to the messenger wires through rigid strips which serve also as supporting points of the contact wires as they fix them in relation to the axis of the track. In terms of design the articulated strips are made to perform as resilient fixing components being rigidly fixed both to the messenger wire and to the contact wire. The ACSC is available in several modifications to meet the different conditions of operation. Within double track tunnels with both tracks electrified only one messenger wire and one contact wire may be used for each track. Nevertheless with such an arrangement the basic feature of mechanical independence of the suspension is ensured too. On open section of main lines electrified with a.c. power and when using a suspension system with a small cross section of the wires only one contact wire is used. The ACSC is featured by a reduced vertical clearance requirement and by a simple design. Standard components of a conventional catenary may be used and no regular adjustment is needed in operation. This feature makes it possible to install the catenary with no compensating arrangement and it also removes all limits whatsoever with regard to the length of the anchor sections. As a matter of fact the length of an anchor section depends only on the power supply system and on the section configuration. When using the ACSC the number of interfacing joints of anchor sections is dramatically reduced. They are only retained at the locations where the catenary power supply has to be separated. It should be stressed that the increased length of the anchor sections has no effect upon the extent of damaged section in case of rupture of the contact or messenger wires. Investigation and experimental tests have proved that in case of rupture of one or even both contact wires the length of the affected zone is limited to one link only. In case of rupture of the messenger wire the zone affected does not increase either. Moreover, in this case the messenger wire can be moved out of reach of the locomotives and trains can be operated at a reduced speed rather than stopping traffic and waiting until the wires are fixed. It is also important to note that by reducing the number of joints and by making the anchor sections longer the ACSC cuts substantially the volume of work involved in installing and maintaining the catenary. When the ACSC is installed on a single or on a double track line (as shown in Fig. 1) a link can be 70 meters long, while the anchor section can exceed 6 kilometers and if necessary it can be even longer. The designed vertical clearance of the ACSC with 70 meters long links is less than 0.8 meters. That means it is two times less than the clearance needed when using the conventional type of catenary. The horizontal clearance (the distance between the fixing points of the wires to the consoles) is about 3 meters. In order to reduce substantially the horizontal dimensions of the 70 meter links stretcher strips are used which are placed between the messenger wires at the middle of the link. This has resulted into reducing the horizontal dimensions by two times. It is best to use insulated consoles when installing the ACSC. This makes it possible to reduce the horizontal clearance needed since the messenger wire will be secured direct to the consoles. Calculations have shown that in this case the links can be up to 90 meters long. The vertical clearance needed will be less than the permissive values adopted on our railways whereas the horizontal clearance when using the stretcher strips will not exceed 2 meters. One of the major advantages of the spatial-rhombic catenary is its high wind resistance feature. Even with 70 meter links the strongest calculated wind loads will not cause any dangerous deviations of the contact wire from their fixed position. On one of the sections wind loads onto the catenary were simulated by applying them at the middle of the link. A calculated horizontal load of 200 N which caused a deviation of 100 mm of the contact wires from the static position. Any further, even insignificant deviation, could be caused only through raising drastically the sideway pressure but this involves the resilient deformation of the wires themselves. Also the rhombic configuration of the catenary prevents the contact wire from being pressed out of reach.of the pantographs by the wind. Moreover, even if one wire would be pressed out of reach, the other one will remain within the working surface of the current collector of the locomotive. In the middle of the link the vertical clearance between the messenger and the contact wires is not less than 0.3 meters. Moreover, the lifting of the contact wire caused by the current collector takes the load off the messenger wire. Consequently the messenger wire goes up and the clearance to the contact wire as a matter of fact remains constant. Since the time the new catenary was put into operation on an open section the current collector has passed the section thousands of times. When checks were made no wear, no burns nor any damages of the catenary could be identified. In order to reduce the number of wires only one contact wire can be installed instead of using two. This is important when the lines are electrified with a.c. power. Also by changing the location of the insulators the messenger wires can be used as separate power supply lines. Fixing the catenary onto transversal structures normally spanning several tracks in station areas is of special interest. The transversal structures can be 60 to 65 meters long. In this case the catenary is fixed to vertical studs which are secured to a horizontal metal beam. The studs may be much shorter than those used for installing the conventional catenary. The spatial-rhombic catenary can be installed without using any vertical studs while placing the insulators above the tracks. When using this installing arrangement the height of the supporting poles may be substantially reduced. Setting up transversal structures spanning station tracks on which the spatial-rhombic catenary is fixed does not involve any technical problems. Such structures may be layed out to install the ACSC alone or in a combination with the existing vertical chain-type catenary. The ACSC has been installed both on tangent track sections and in curves. On one of the test sections this catenary consisting of 35 meter links is installed in a curve with a 120 meter radius (as can be seen in Fig. 2). The ACSC is most suitable to be installed in tunnels, galleries as well as on other structures. The limited vertical clearance needed makes it possible to reduce fundamentally the space of tunnels needed to install the catenary. The assessment of the design of the spatial-rhombic catenary installed in tunnels and on other structures has shown that it can be installed even when space is extremely limited, where nothing but a metal power bus can be used only. Yet the very good dynamic properties make it possible to run trains at much higher speeds than with any other conventional type catenary even if it is especially designed for being installed in tunnels or on other structures. The automatic compensation feature is another major advantage of the ACSC. As it is using anchor sections of an unlimited length due to compensating automatically, the changes of the length of the wires caused by the temperature fluctuation, it is not necessary to provide niches in tunnels. Thus reducing the height of tunnels and dispensing of niches will result in cutting substantially the construction cost ol tunnels and other track structures. A decision has been taken in this country to use exclusively the spatial-rhombic catenary when building new tunnels. 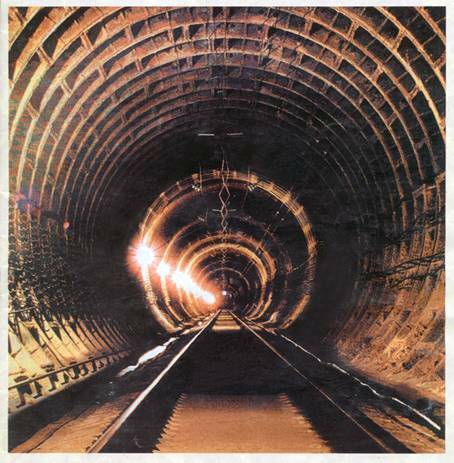 The ACSC has been installed in the tunnels on the Baikal-Amur mainline, in the Caucasus as well as on other lines. In Figure 3 an 8 kilometer long tunnel can be seen. The catenary installed in the tunnels has 26 meter long links with two rhombic contact wires in each link. The vertical clearance of the catenary in this tunnel is 0.2 meters and the insulation is not included. The insulators can be placed not only as shown in the Figure but at any other location but closer to the axis of the track. As a matter of fact the insulators can be located in such a way that the vertical clearance of the catenary will not exceed 0.2 meters. The horizontal clearance of the catenary does not exceed 1.0-1.2 meters. The catenary link of the tunnel section is part of an integrated anchor section which is 9 km long. The limited zone of damage is confined to one link only, that is not exceeding 15 meters in case of rupture of the wires which is another important feature of the ACSC designed for tunnels. The experience gained over the years the catenary has been in operation, proves that it is highly reliable. A 2 km long tunnel, which is unique in terms of design has been put into operations (see Fig. 4). It has a form of a loop located in a curve with a 300 meter radius and a 25%0. gradient. The complexity involved in the installation of the catenary were the extremely limited space of the tunnel and that it had to be installed in a curve. Yet that problem has been solved successfully while using the spatial-rhombic catenary with 18 meter long links consisting of two rhombs. Trial runs have shown a high reliability of the system. Work has been started to electrify a 15 kilometer tunnel. The catenary in the tunnel and on the adjacent section have been integrated into one section. Electrifying double track fixed structures is of special interest too. Those structures might be tunnels-, snow preventing galleries, bridges or other structures. The shape of the tunnels and of the galleries and their vertical clearance differs substantially from each other, hence for each of them a special scheme has to be worked out for the installation of the catenary. The experience gained in designing the catenary for double track fixed structures show that out of four wires a spatial-rhombic catenary can be made covering two tracks. However, the principal feature of the catenary is ensuring the mechanical separation of catenary of the neighbouring tracks. The dynamic properties of the catenary are of high quality too. This makes the design of the catenary most simple and results in reducing the cross section of the wires which is important when electrifying at a.c. power. Using the ACSC on open track sections over an extensive period of time as well as in tunnels has proved the high reliability and economic efficiency.